Will oil remain king in Saudi Arabia? Leave a Comment on Will oil remain king in Saudi Arabia? Saudi Arabia has bold plans for the future of its economy, but will it really work? Saudi Arabia topped the IMF’s “World Economic Outlook” report for fastest growing economy, with a predicted 2018 GDP growth of 2.2%, up from -0.9% in 2017. Released this week, Saudi Arabia’s predicted rapid growth is a result of the 2030 plan that boasts a diversified economy away from oil, the development of public sectors like health and tourism and the establishment of Saudi Arabia as the hub of the Middle East. Saudi Arabia holds 20% of the known oil reserves in the world while petroleum accounts for 70% of their 2017 export earnings, making their economy extremely dependent on the price of oil. After the oil crisis of 1990, the invasion of the state of Kuwait by the state of Iraq pushed the price of oil to $63 per barrel (July 2017 adjusted). After this attack, the price of oil stagnated between $20 and $40 per barrel throughout the rest of the 1990s (July 2017 adjusted). In response to these depressed oil prices, Saudi Arabia’s GDP followed a similar stagnation, growing between 3.98% and 2.89% in 1992 and 1998, respectively. Even 20 years later Saudi Arabia faces similar problems as 42% of their GDP is from petroleum. Another major source of Saudi Arabia’s revenue is its state-owned oil company, Arabian American Oil Company (ARAMCO). Analysts have projected that the company’s value could be about $10 trillion, further showing how large and important oil is for the country’s economy. With a country so dependent on oil, Saudi Arabia’s Crown Prince, Mohammad Bin Salman Al Saud (MbS for short), has recognized the need for Saudi Arabia to diversify the economy away from oil by creating the so-called 2030 plan. MbS’ 2030 plan has two main pillars. The first pillar is focused on Saudi Arabia’s “status as the heart of the Arab and Islamic world”, while the second pillar affirms the goal that Saudi Arabia become “a global investment powerhouse.” Under these broad statements are a variety of programs that focus on revolutionizing every aspect of Saudi Arabia. Some programs include the Quality of Life Program and the Privatization program. The most interesting program is the Fiscal Balance Program, which focuses on balancing the government budget, increasing non-oil revenues and improving spending on programs and projects. Launched in 2016 the Fiscal balance program is a medium–term program that is scheduled to be completed in 2020. MbS plans to focus on government financial accountability, improved fiscal and macroeconomic planning (through export initiatives, a government-backed venture capital firm and energy price reforms), maximized government revenues and more efficient government spending. After about a year of implementing economic initiatives, like a value–added tax and expat levies, these economic programs are expected to generate SAR 85 billion (~22B USD) in government revenues. Likewise, MbS has tried to move forward with an IPO of a 5% stake in Aramco in order to determine the public value of this strategic asset. However, the processes continues to be pushed back as there has been issues with valuing the stake as well as where to list the stake on the international markets. As of October 5 2018, MbS has promised a 2021 IPO, after stating 2018 and 2019 as possibilities. This IPO is a necessity for the 2030 plan as it opens this famously secretive country to foreign investment, which creates an open culture that allows for new business to diversify the economy. Another step that Saudi Arabia has taken to diversify revenue streams away from oil is Fintech investments, with some companies including Tesla and Lucid. With a 5% stake in Tesla and $1 billion investment in Lucid, Saudi Arabia is explicitly backing to the electric vehicle and non-oil cars of the future. 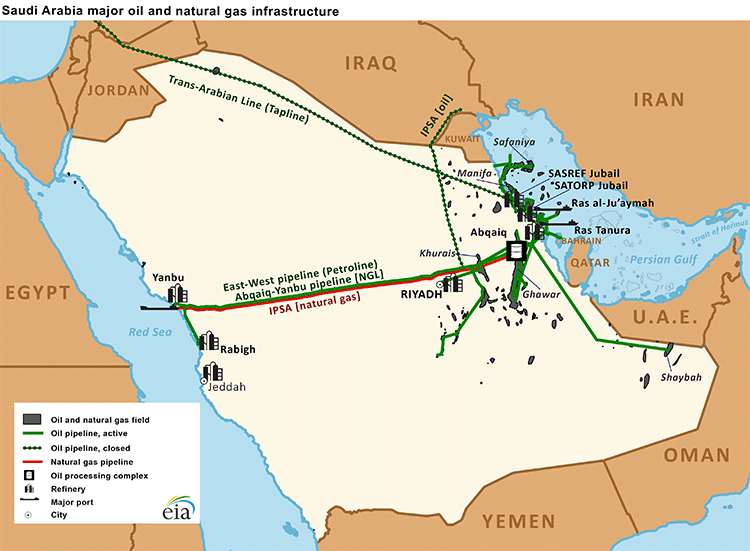 Will Saudi Arabia’s attempt to diversify away from oil work? Only if Saudi Arabia plays their cards right. During the early 2000s, Chile had similar a diversification plan as Chile is an extremely metal-rich country, holding 38% of the world’s copper supply. Discussion on the country’s reliance on metal exports began after copper prices reached new highs in 2004, and the government decided to focus on export diversification. Chile began to export other resources like salmon, wine and pork. In 2004, 26% of Chile’s exports were refined copper, and after programs that encouraged innovation and entrepreneurship, refine copper exports dropped to 20% in 2016. Chile’s diversification was successful as they were open to innovation and new businesses entering the market. This openness to innovation will be the key to the success of the Saudi Arabia 2030 plan; however, looking at the failure of the ARAMCO IPO and their investment in Fintech companies, Saudi Arabia needs to prove to the world that they are actually willing to diversify their economy, instead of investing across a few companies in an innovative sector. The ARAMCO IPO would show the global markets that Saudi Arabia is making strides to modernize as foreign investors would have access to a famously secretive state-run company, and investing across sectors beyond Fintech would protect Saudi Arabia from risks that come with single sector investing. Likewise, in order to successfully execute the Saudi Arabia 2030 plan, MbS needs to disseminate his consolidated power across different political bodies. So much power in one place is dangerous as MbS has no checks on his power. While easier suggested than executed, the spread of power across an autocratic government like Saudi Arabia is necessary when focusing on a progressive agenda like diversifying the economy. While Saudi Arabia faces many challenges when executing the 2030 plan, one positive factor is the support of the people, especially young citizens whose craving for innovation and entrepreneurship coincides with the 2030 plan perfectly. Lina Tahlawi, a young entrepreneur says she is “proud to be a Saudi entrepreneur watching all these achievements happening in a very short time with success”, and Bahaa Gazzaz, another entrepreneur, reflects that the 2030 plan “allows [young people] to ride the wave of changes and imbues [young people] with confidence, purpose and determination”. Without such support from the people, the 2030 plan would not be achievable, so the people’s support of this plan is imperative to its success. Varas, M. E. (n.d.). Economic Diversification: The Case of Chile[PDF]. Revenue Watch Institute.